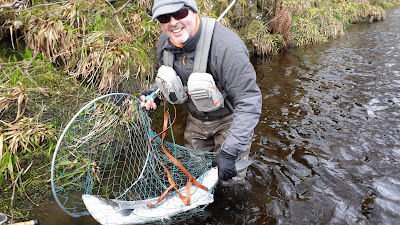 Very nice fishing conditions today and with two fish caught at the Dam and two – including our first of the season – caught on our Sawmill beat it was an excellent start to the week. Martin Wilson was first into action on our Dam beat with a fish of 14lbs caught on Port-na-Craig bank first thing in the morning and Bruce Campbell followed up with a fish of 12lbs from Pitlochry bank shortly after – both were caught on the fly. Further downstream at Sawmill Ally Gowans caught a fish of 8lbs then within half an hour landed another of the same size – both on the fly! Great to see our beats fishing well and with the river set to drop back over the next few days it’s looking good for the rest of the week. 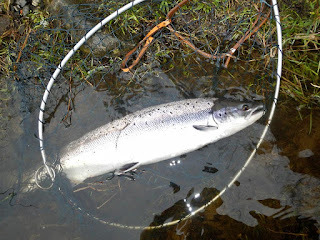 The first of two fish for Ally Gowans on Sawmill today!